Got a late start around 9:00 am and looked to be a slow fishing day. Water was flat, full sun, and water 40.3 degrees right out of Garfield Bay. I headed east toward the mouth of the Clark Fork and figured I would fish that direction until I either ran into weeds or turn around to head in as I had to be off the water by 3:30. Fished up the middle until I was about even with Deadman and decided to try the shore line so turned the boat south. I got my first fish about 10:30 which was just a 14″ rainbow on a rapala and after returning it to the water set about changing up most of my gear as it looked like it was going to stay flat for the rest of the day. I picked up two more fish off the Monarchs on small rapalas that were about the same size as the first. I started wandering toward the west around 12:00 and noticed that there was some wind picking up out of the south. As I crossed in front of Indian I was on the phone with another member and noticed that I had a release and the fish was taking quite a bit of line. The fish flelt quite heavy, but was coming in with little problem until it got to around 100′ and pretty much said that was enough. It launched itself into the air three times showing a lot of color and after the third time out of the water it spit my rapala back at me. Fish looked quite skinny, but long and most likely less than 10 lbs. After that it was one calamity after another. I got a 21″ rainbow that managed to get two other lines before I got it to the boat, as I released that fish I had another stout fish that took line and that I didn’t get an eyeball on that hit an apex. At least that lure came back to the boat without any other lines. 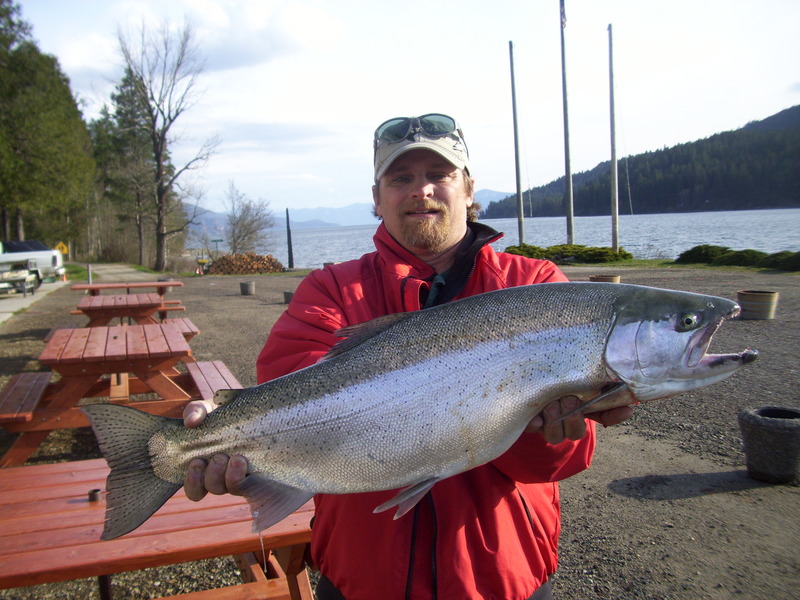 I decided to head back toward Garfield and caught another 20″ rainbow and noticed that I was down to three poles left out. I decided to pull them in and call it a day. As I reached for the single pole left on my Port side I heard that wonderful scream behind me and the outside most pole on the other side was bend horizontal and screaming. As the wind was behind me I reduced speed as much as I could and had the fish on for about 5 minutes, it was a pretty good give and take but I never got the line counter to less than 400′ and as my day had gone before the line just went slack. I reeled the line in to find my rapala rolled into a ball as only the large rainbows seem to have learned to do. I called it a day, got into the dock, readied my gear for another day, and sharpened a lot of hooks.